DM Metalloys Pvt. Ltd. is a distinguished manufacturer, supplier, and exporter of Stainless Steel 304/304L/316/316L No.8 Finish Sheets. No.8 finish is highly reflective 'mirror' finish. Produced from 2B finish by polishing with consecutive finer abrasives following by extensive buffing. Mostly used in architectural applications. No. 8 Finish in 304/304l/316/316l is the most philosophical polished finish that is enclosed by the ASTM standards. In comparison to a No. 7 finish, the grit lines are much less noticeable, but they can be seen if the finish is inspected closely. The resulting finish is mirror-like but not a perfect mirror. DM Metalloys Pvt. 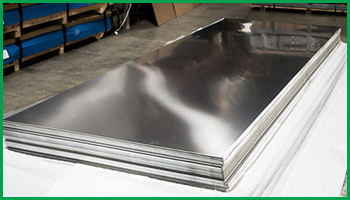 Ltd. Supplies Stainless Steel 304/304L/316/316L No.8 Finish Sheets in Faridabad, Gurgaon, Gurugram, Gaziabad, Noida, Lukhnow, Delhi, Delhi NCR, Ludhiana, Amritsar, Chandigarh, Jalandhar, Baddi, Punjab, Uttar Pradesh, Haryana, Mumbai, Pune, Sahibabad, Meerut, Manesar, Bhiwadi, Bawal, Neemrana, SIDCUL, Sonepat, Ambala, Mohali, Panchkula, Kapurthala, Bareli, Kanpur.